How to Find the Perfect Passover Haggadah for your Seder | Skinner Inc.
Each Passover, Jews around the world fulfill the commandment to retell the Israelites’ liberation from slavery in Egypt. In Hebrew, the word for this telling is Haggadah (plural: Haggadot), and the name of the ritual meal is Seder. A Haggadah text supplies an outline of the order of the Seder along with poetry and songs. However, like much Jewish ceremonial art, each Haggadah may have its own distinct and fascinating characteristics. Jewish communities span the globe, and these different regions have developed their own interpretations of ceremonial art and texts over the past centuries. From the middle ages through the present day, there have been over 7,000 distinct versions of printed Haggadah. That fact amazes me! The text has also been translated into more languages, and revised more times, than any other Jewish book. The Maxwell House Haggadah remains the most widely used version in the world, with over 50 million copies in print, but endless other options are well worth seeking out. 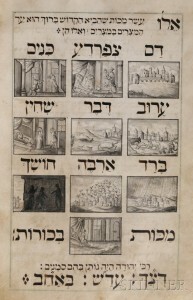 While each Haggadah provides much of the same basic content, the diversity in decoration, illustrations, language, and commentary appeals to collectors searching out books from different time periods, geographical locations, and forms of artistic embellishment. At auction, we’ve offered examples ranging from 18th century manuscripts to modern day texts, including facsimiles of important historical haggadot such as the Birds Head Haggadah and the Kaufmann Haggadah, as well as interpretations by prominent 20th century artists including Jakob Steinhardt, Arthur Szyk, Siegmund Forst, and Ben Shahn. 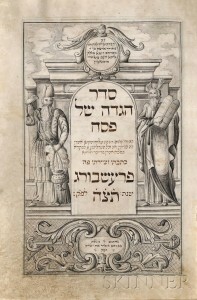 View examples of Haggadot offered in Skinner Fine Judaica auctions. The Herlingen Haggadah is a truly stunning example, and it sold at auction for an impressive price of $450,000. However, antique haggadot are available at a range of price points, to fit the taste and budget of any avid collector. Also, the Haggadah isn’t the only important component to a Passover Seder. Skinner Fine Judaica auctions also offer Seder Plates, Matzah Bags, and more. What family heirlooms are part of your Passover Seder? This entry was posted in Blog and tagged Aaron Wolf Herlingen, ceremonial art, ceremonial books, Fine Judaica, Haddadot, haggadah, Haggadah shel Pesach, jewish art, jewish books, Jewish traditions, judaica auction, Kerry Shrives, Passover, Pressburg, rare book, Seder by Kerry Shrives. Bookmark the permalink. Director of Fine Judaica, Skinner, Inc.